FalconSAT-6, is a microsatellite developed by the U.S. Air Force Academy and sponsored by the USAF Research Laboratory (AFRL). The main experiment aboard FalconSAT-6 is a multi-mode flight experiment designed to prove the effectiveness of multiple thrust modes. Several other experiments will also be carried, and among these are experiments designed to prove and provide the most fuel-efficient changes in orbit which are available, and to test low energy ion head thrusters, testing the effectiveness of wireless versus wired telemetry, and measuring changes to the local ionospheric environment. 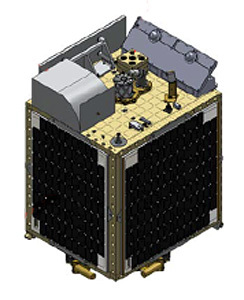 FalconSat-6 hosts a suite of five payloads to address key AFSPC Core Function Master Plan (CFMP) needs: space situational awareness (SSA) and the need to mature pervasive technologies such as propulsion, solar arrays, and low power communications. The primary payload is the AFRL Space Plasma Characterization Source, Mark II (SPCS-2), which is a reflight of the modified COTS Hall effect thruster (HET) payload flown on FalconSat-5. Since FalconSat-5 was unable to complete the experiment objectives due to electrical power system anomalies, FalconSat-6 will address many of the same SPCS objectives. A companion experiment to SPCS-2, the Contamination Measurement Experiment (CME), will measure contamination from SPCS firings, ground handling during integration and test (I&T), launch vehicle environments post-encapsulation, and on-orbit outgassing. The USAFA-developed payloads are Cerberus, demonstrating a cuing architecture for space situational awareness (SSA), and the Harmonic Ionospheric Propagation Experiment (HIPE), which investigates the propagation of harmonically associated sinusoids through the ionosphere from a low power, on-board transmitter. Finally, an AFRL payload is manifested to evaluate new solar array technologies including advanced solar arrays, Inverted Metamorphic (IMM) cells, and flexible circuits.